It’s no secret that the bleeding edge of modern technology comes at an exorbitant cost, and all the more so if the tech in question happens to feature one of the most innovative new displays around. To hammer that point home, LG’s newly-released 55-inch Curved OLED TV will set flat-screen haters back a cool 15 million won (£8,725) if they wish to pre-order the device now. That’s a pretty mind-blowing price tag, but it might just be worth it if you believe what LG has to say about its latest Smart TV technology. 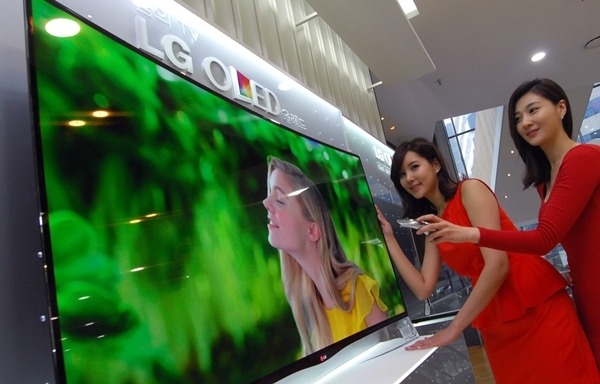 According to the Korean firm, which really ought to know considering they’re streets ahead of everyone else when it comes to OLED, the new LG 55EA9800 brings an IMAX-like viewing experience into your living room. Crucially, the curved display ensures that all points of the screen are “equidistant to the viewer’s eyes”, thus doing away with any edge-of-screen distortion and loss of detail that’s customary on larger, flat-screen TV sets. That argument is probably debatable, what with reviews generally describing the latest generation of 4KTVs as ‘absolutely mind-blowing’, but as is usually the case when it comes to TV, we’re sure that curved TVs will have their fair share of proponents and detractors. Nevertheless, for a truly IMAX-like experience, demo images from CES show that it’s possible to configure three of these screens next to each other, assuming that you have over £25,000 to spare and a lighthouse to set them up in. We should also reiterate that this is OLED we’re talking about, incorporating LG’s proprietary WRGB technology that features sub-white pixels working in concert with conventional reds, blues and greens to generate the most vivid colors ever seen on a TV display. As for the specs, the curved OLED is actually not that much different from its flat-screen sister, the 55EM9700, which went on sale earlier this year at a slightly more affordable £6,300. The display is just 4.3mm thick, and the entire thing weighs just 17kgs, while boasting an assortment of inputs and “thin, transparent film speakers” built into the stand. It’s anyone’s guess as to whether or not curved OLED will actually catch on among consumers, or whether most people will dismiss it as just a novelty. While OLED itself undeniably has a very promising future, the premium consumers are asked to pay for a curved screen might dissuade buyers from embracing this particular model. But then again, anyone with £8k to spend on a TV probably has more money than sense anyway, so it might do better than expected. Moreover, while 4K TVs are expected to outsell OLEDs for the next couple of years, it’s worth bearing in mind that native 4K content is still extremely hard to come by – an issue that OLED viewers won’t need to worry about. LG says that it’s already taking pre-orders of its 55-inch curved OLED in South Korea, with the devices due to ship this May. As for the release dates and pricing outside of Korea, this will be revealed in “the coming months ahead”, though going by LG’s track record, we probably won’t have too long to wait.